In the October 1995 issue of North and South magazine, political scientist Joe Atkinson suggested that former Prime Minister David Lange had been too lazy to take on the difficult aspects of that job. 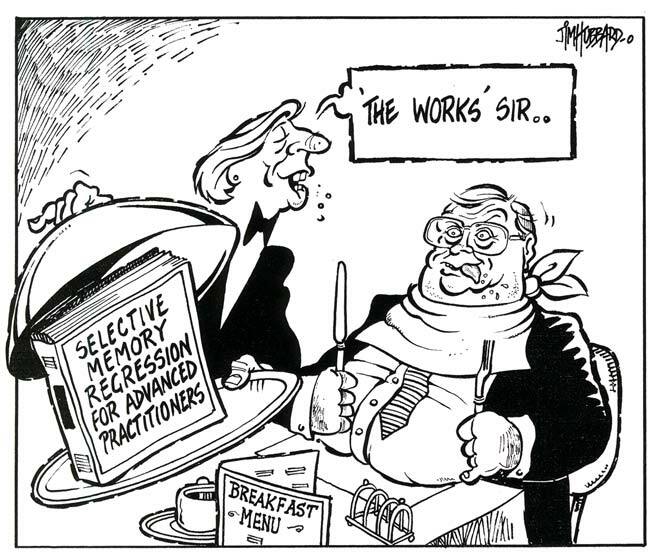 The accompanying cartoon played with the article's suggestion that Lange suffered from 'false-memory syndrome' in his portrayal of himself as prime minister – as well as his comments about hotel breakfasts in New Zealand. Lange considered the article (and cartoon) to be defamatory and took Atkinson to court in 1996. After the case went through a series of courts, the Court of Appeal eventually decided that journalists had a defence of 'qualified privilege' – meaning that they could criticise politicians on the basis of their 'honest belief'. The findings in the case have given New Zealand media greater freedom to comment on the performance of politicians. Download the PDF to read Atkinson's article.